Product prices and availability are accurate as of 2019-04-19 13:50:51 UTC and are subject to change. Any price and availability information displayed on http://www.amazon.com/ at the time of purchase will apply to the purchase of this product. Created with timeless style, this stackable 3-tier stand is perfect for both new wine collectors and expert connoisseurs. 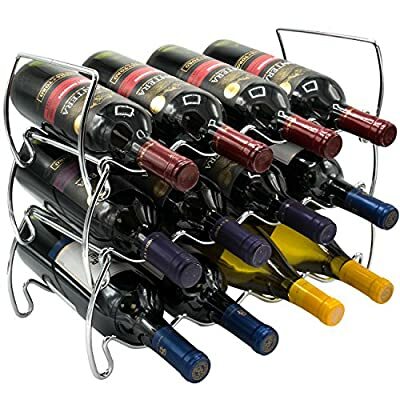 It's functional, coordinates well with existing décor, and ideal for any flat surface area in a pantry, storage cabinet, kitchen, dining room, basement, wine cellar, or bar. With a beautiful scallop shaped frame, each wine bottle is stored horizontally ensuring both the wine and the air bubbles are in contact with the cork. Its versatility allows you to customize your space by stacking vertically or side by side without wobbling or tilting. Designed with small spaces in mind, this lightweight wine rack is a great for counters and cupboards.